You might remember Antonella as MyMiniReviews on Instagram. 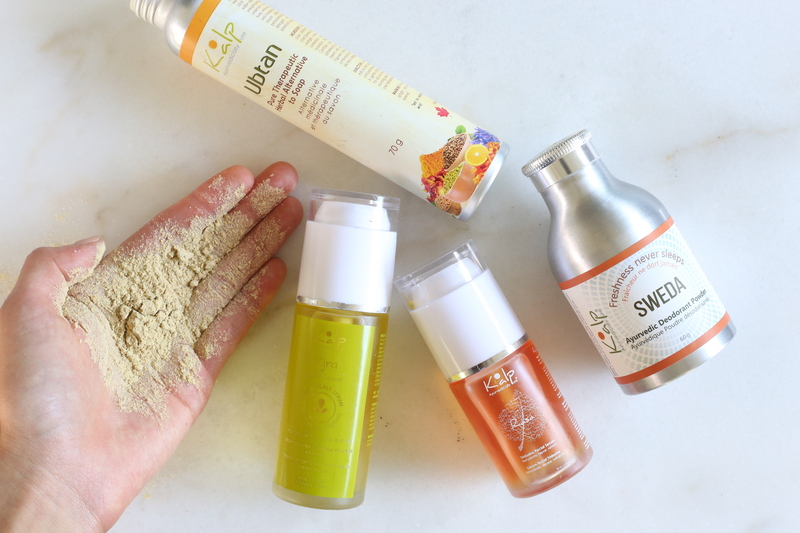 She’s an Instablogger in the green beauty community and esthetician that I once had on the blog during my “Skin Talk” series where I interviewed estheticians. Like many others I’ve known during my time on Instagram, she quietly disappeared without a word, so I was happy to hear from her when she messaged me. It turns out she was diagnosed with cancer from the HPV virus and on her 21st birthday no less. Obviously it’s scary to open up about such a thing on one’s Instagram so I offered doing an interview style post for her – which I’m not sure is less or more scary. But whatever the case, go show her some love on Instagram and say hey! You’ve been through a difficult time. Can you share with us what happened? Yes! Unfortunately I’ve been having lots of health issues on and off. The past year and a half I was going through a lot of ovarian health issues, I was having back to back ovarian cysts that kept rupturing and was diagnosed with endometriosis. I kept having excruciating cramps and knew something was off. I also had a complicated lower eyelid surgery. Due to my accident back in 2013 where I had to get facial reconstruction surgery and had a few more after. 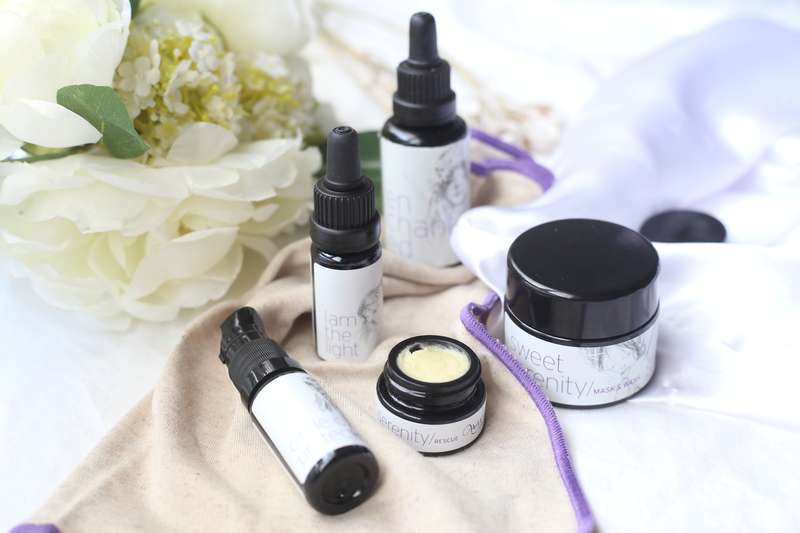 I also wanted a break from the green beauty community I’ve been a bit disappointed with certain brands and just there not being much diversity going on. What has been helping you cope? I give thanks to our creator, praying, keeping myself focused with scriptures. Thankful for certain family and friends. I was doing a lot of yoga too and meditation. Has this experience changed you at all? It’s made me more patient and understanding. And stronger! Have you noticed any change in your skin? How have you adjusted your skincare? Yes I have! My skin was breaking out for awhile due to hormonal issues. I also adjusted my skincare to a much simpler routine, being in the esthetics field I always have a ton of products to try. Another skincare question, what do you recommend for pre-fall skincare. I love an antioxidant serum for the daytime! Of course a good exfoliador for once a week. And a lot of people might find they need a thicker cream for their Face and body. 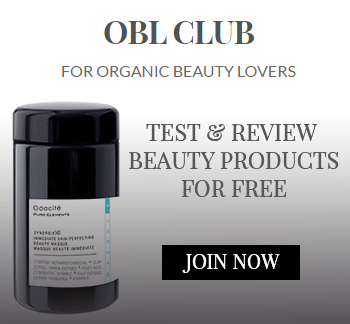 Green Tidings is a brand I have used and known for years and they even launched an OBL CLUB campaign to have dozens of members test and review their products. You can see what the OBL community thought here. The line was started by Jenny, who after losing her sister to cancer when she was 19, studied natural health and nutrition as a means of preventative health. 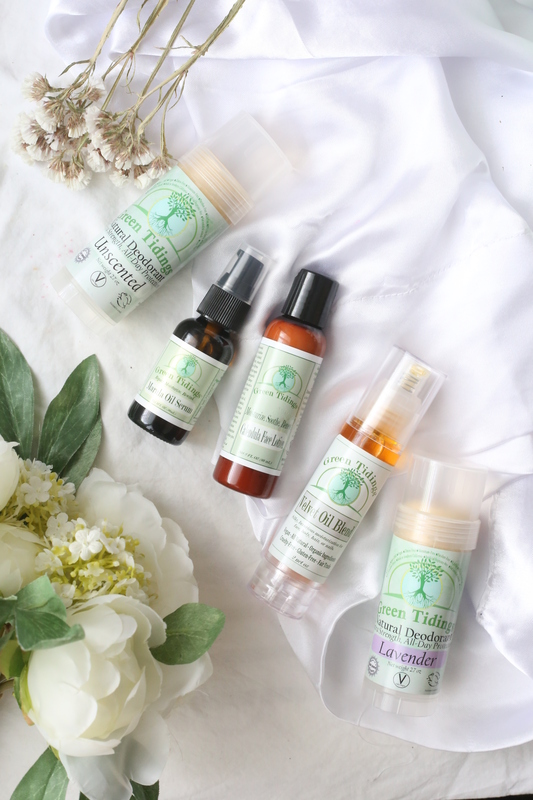 After having her first child, she created a nontoxic deodorant and since then has expanded Green Tidings into a well-rounded bodycare and facecare line. Their products are nontoxic, vegan, cruelty-free and organic- made in a solar-powered facility and packaged by a nonprofit who provides meaninglful employment to people with disabilities. The deodorant comes in Lavender or Unscented and is a nontoxic, organic, vegan deodorant made right in Southern California. After using it different seasons and climates, I’ve found that the consistency varies and it can be anywhere between a bit dry/grainy to soft/mushy, especially in very hot weather. There has been some major heat waves lately around the world! A lot of product tends to come off so really only 1 or 2 swipes is needed per armpit. Please note it’s not an anti-perspirant so you WILL still sweat. Even through super hot days I found myself stink-free at the end of the day (personally I do not have terrible B.O. unless I am under a lot of stress!). This is a multi-purpose thick oil made of a blend of carefully selected oils for face, hair, nails, or body. True to its name, it does make your skin feel velvety after use and works as a great hair-defrizzer. The scent is not feminine or floral – it smells largely of sesame seed oil (it’s 2nd ingredient) and doesn’t contain essential oils to change the scent. Judging by its name I assumed this would be a pretty standard face oil serum containing marula and some EO, but it has an interesting ingredients list with Watermelon Seed oil, Black Currant seed oil, Balloon Vine extract (anti-inflammatory and helps with eczema, dermatitis, and psoriasis) and Neroli Flower oil among others. I love Neroli so I definitely appreciated the inclusion of this ingredient. The Marula oil is a lightweight, hydrating oil that absorbs very well and has a sweet neroli and herbal scent that isn’t overpowering. On the thicker side, this face lotion hydrates, soothes and calms skin with ingredients like Myrtle Leaf, Calendula, Borage Seed, Oat Bran, Foraha Fruit, Palmarosa Leaf and more. It has a yellow tint to it but does not tint the skin at all and I greatly appreciate the first ingredient is Aloe leaf juice NOT water. There is no skimping here. I think this is a great product, but the packaging detracts from the overall experience. It’s a disk top cap similar to shampoo bottles, because this is a small bottle it’s hard to squeeze the product out because it’s not a liquid gel. A pump bottle would be a better alternative. Organic Jojoba Seed Oil: Anti-bacterial and anti-inflammatory. Very hydrating; keeps moisture in while keeping bacteria out. Helps to reduce wrinkles and stretch marks. Hypo-allergenic. Organic Sesame Seed Oil: Known as the “Queen of oils.” High in linoleic acid, which is anti-inflammatory and anti-bacterial, and may help with eczema, psoriasis, dermatitis, acne, and irritated skin. Contains antioxidants, which fight free radicals, and are anti-aging. Rich in Vitamins E, D, and B Complex, which have been shown to reduces scars and skin rashes. Anti-bacterial. May repair damaged skin cells. Moisturizes and softens skin. Poppy Seed Oil: Super silky, it is high in fatty acids such as linoleic acid, which can help eczema, psoriasis, and inflammation. May help with dandruff. Highly moisturizing, and great for dry, aging, and mature skin. Has skin barrier and protective properties. 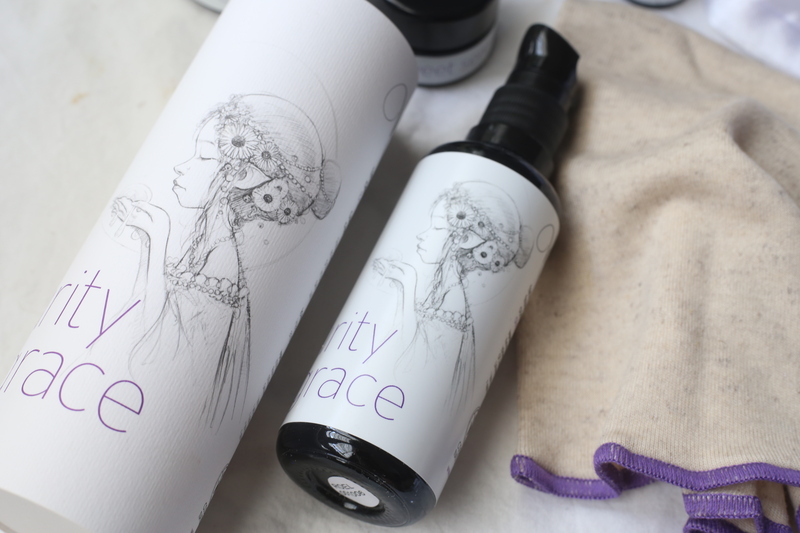 Tung Wood Oil and Brassica Campestris Oil Blend: A purified blend of two oils, which provide natural moisturizing and skin conditioning, with great humectant properties. Carrot Seed Oil: High in antioxidants, which protect against free radicals, and are antiaging, and may help with rejuvenating, firming and toning skin. Moisturizes without clogging pores. Contains carotol, which can rejuvenate the look and feel of skin. Helps with age spots and circulation. Vegan Vitamin E: Antioxidant. Repairs damaged skin, fights wrinkles, helps heal scars. Natural preservative. Sunflower Seed Oil: High in essential fatty acids and Vitamin E, and is moisturizing, anti-bacterial, anti-microbial, and reduces inflammation. It is great for wrinkles, and helps improve skin clarity. “The higher an ingredient vibrates, the purer, the more lit from with in, the gentler yet the more intense it is. The better it can communicate on a cellular level. 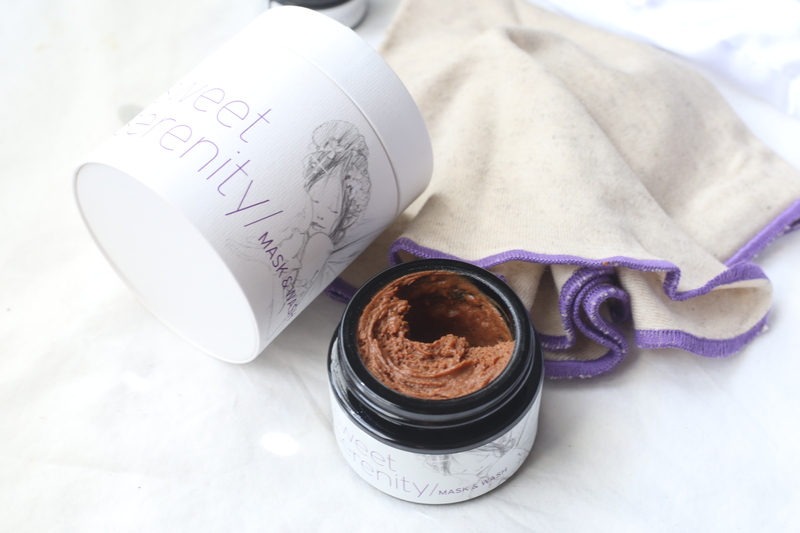 The Sweet Serenity Mask & Wash is a product I like to use exclusively as a mask because it’s so luxurious and I want my skin to experience the maximum benefits it provides. I add several droplets of water to turn it into a light brown creamy consistency, take a deep breath and apply using my fingers or a mask brush. Besides its light exfoliation benefits, I notice my skin looks hydrated and glowy after use. I think this is a gentle yet effective mask if your budget can allow for it. 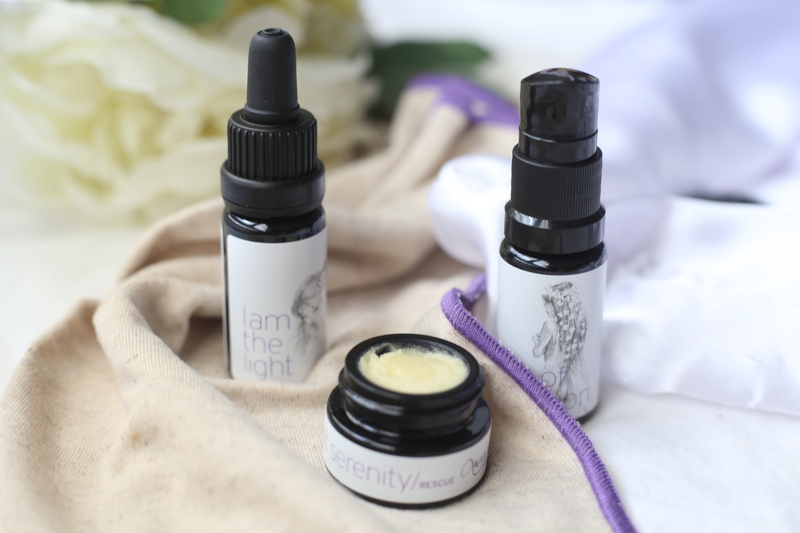 Pictured above is their new travel kit which includes a travel size version of the I am the Light Facial Oil, Sweet Serenity Rescue Balm and Circle of Protection Body Oil – perfect for keeping skin and body pampered during your travels. Max and Me offers 7 exquisite body oils for the luxury seeker, and Circle of Protection is their most popular. It has a ravishing scent from the fragrant vetiver, magnolia, bourbon geranium and manuka along with exotic litsea, sparkling silver fir and jasmine. This one is for those who want to take their bodycare to new heights. The Enchanted face oils is one of my favorite face oils and features a blend of argan, marula, macadamia nut, rosehip, pomegranate, evening primrose with jasmine, frangipani, a thousand roses, champaca, sandalwood and lavender. Every use is like an experience that I relish – it’s hard to describe. It has a complex, sophisticated scent that you won’t find in any other face oil. This oil is for sensitive, irritated and mature skin and provides deep hydration, regenerative benefits and antioxidant delivery. This rich oil cleanser works to melt away the day’s pollutants, impurities, make-up and the buildup of environmental and digital toxins. The Purity and Grace also boosts micro-circulation, encourages the flow of lymphe and blood, and releases congestion and dullness with mountain juniper, atlas cedar, hyssop and neroli. It has a subtly sweet earthy scent. I apply 3 to 4 pumps and massage it into my skin and then wipe it off using their face cloth which is made of 50% eucalyptus wood fibers, 25% organic linen and 25% algae. With Mother’s Day fast approaching I’ve decided to whip up some gift inspiration based on what I would actually get my own mom. In reality I haven’t decided on anything yet! My mom is super picky about her beauty products so I’m not about to waste a bunch of money on a gift she won’t use. But don’t be like me and get to it! GLOW ADVANCED, a new and improved bio-fermented super-food beauty blend with more antioxidants, more minerals, more vitamins and extra probiotics designed to improve gut health and enhance the skin from the inside out. He Shou Wu is a traditional Taoist Herb & Jing Tonic that has a history of use as a longevity, anti-aging, blood-building, beauty, & rejuvenation food. Regular consumption of this herb may do the following: tonify and nourish the blood, hair, skin, nervous system, sexual center, shen (Spirit), and Jing (primary essence/life force). Tocos is considered the “Ultimate Skin Food”. It is an incredible superfood and creamy addition to any healthy recipe. It is a Bio-Available Source of Vitamins D & E that may Promote Healthy Skin and Connective Tissues and Facilitate the removal of toxins from the body. This is a given and should be in addition to whatever you’re getting her. 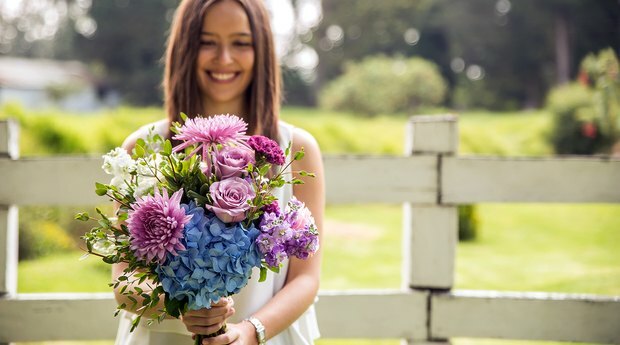 Gilt City is offering great deals on flowers with Bouqs and Enjoy Flowers. Take an extra 20% off your order with code WELCOMEBACK. I really enjoy the natural and nontoxic Lite+Cycle candles which aren’t made with toxic paraffin wax and blended right in Los Angeles. 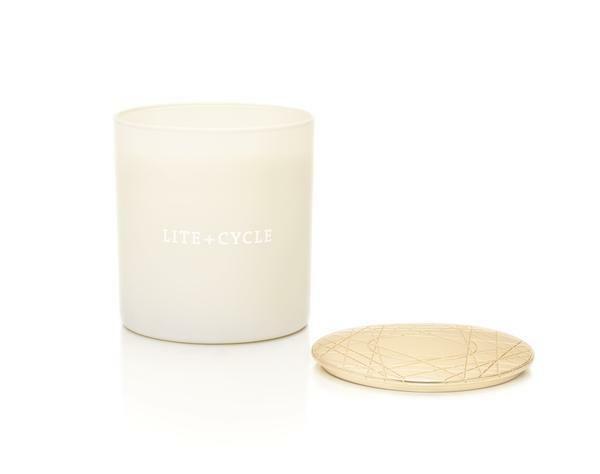 MADE WITH: 100% pure essential oil fragrances, American-grown soy wax, and a cotton wick WITHOUT: paraffin, dyes, lead, animal by-products, or synthetic fragrances. The underside of the gold lid is designed with a custom pattern that creates a textured surface for igniting a strike-anywhere match. 65 hour burning time. TIP: Sign up for their newsletter to receive 20% off. Get your mom to start using skin technology early! The earlier the better so she can age gracefuly into her 60s and beyond. I personally try to use mine at least once every few days and I feel like it will make a difference down the line. The NuFace is multi-solution facial toning device is FDA-cleared, clinically-tested, and consumer reviewed for improved facial contour, skin tone, and wrinkle reduction to give you a more radiant, younger looking appearance. This device costs a hefty $325 so if you’re strapped consider the refreshed Mini version at $179. Treat your mom to a pampering spa day or get her a gift card for a treatment. 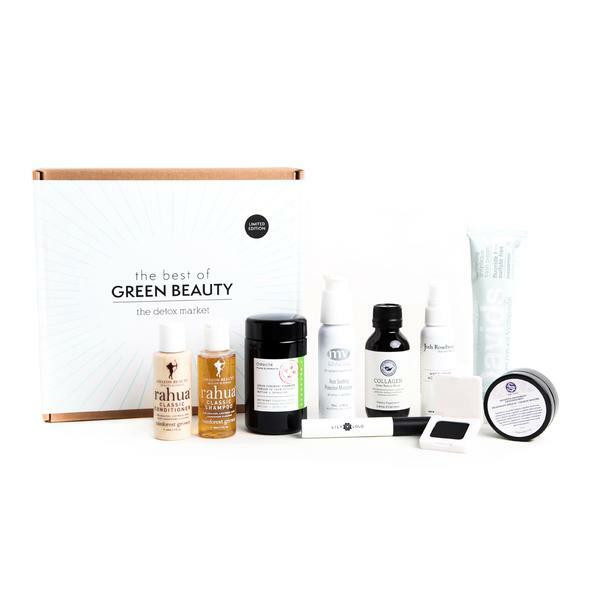 best of green beauty box. 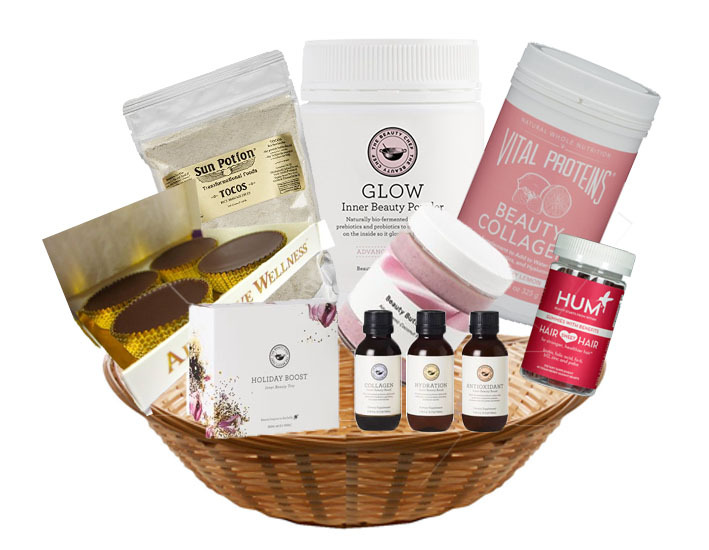 Bi-monthly eco-luxury beauty box Boxwalla is only getting better and better so I have to recommend it. 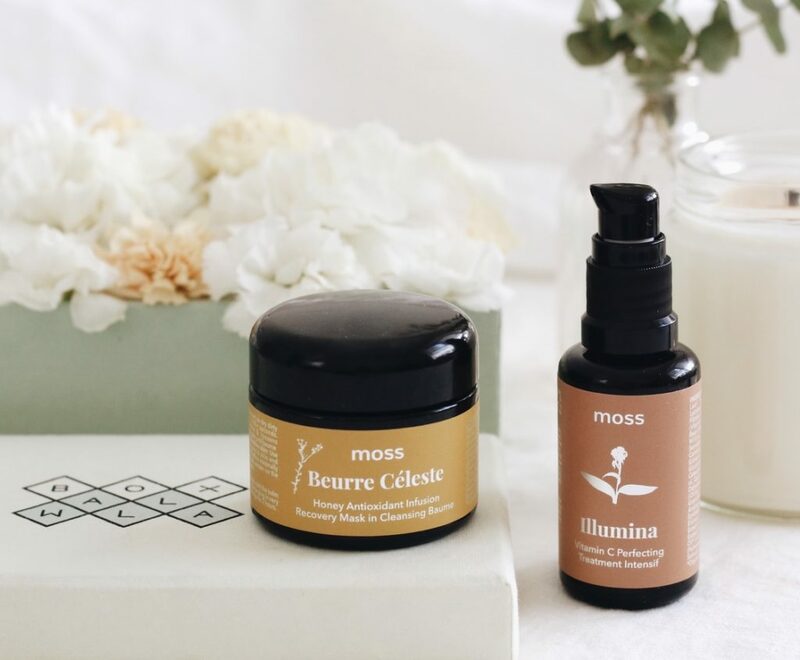 With previous boxes including high-end organic brands MUN Skincare, Twelve Beauty, Earthwise Beauty and June’s box featuring MOSS Skincare I’m sure mom is going to enjoy every box. Each box usually has a value of over $200 in my experience and costs $49.95 every other month. You can also cancel at anytime, but I’m sure you’re going to want to just change the address and re-direct the packages to your home instead.